Home Australia v/s Sri Lanka Australia v/s Sri Lanka 2nd Test, Day 4 in Canberra. Australia v/s Sri Lanka 2nd Test, Day 4 in Canberra. 10:01 IST: -Tim Paine is handed the Warne-Muralitharan Trophy and he celebrates with the entire team. A sight many Australian fans would have been craving to see. Sri Lanka have plenty of work to do. They travel to South Africa for another test against quality pace bowling. The Kangaroos travel to India now for some white-ball cricket. We enjoyed having your company for this one. Hope you enjoyed ours. There's plenty of cricketing action coming up. 09:57 IST:- Australia captain, Tim Paine, says it's a good way to finish the summer as this group has been working hard and they are seeing the results now. States that it doesn't matter what the wicket's like when you have quality batsmen in the team. Applauds his pacers and spinners for bowling as a unit and getting the job done. Feels that they are getting the rewards for their hard work which is pleasing to see. 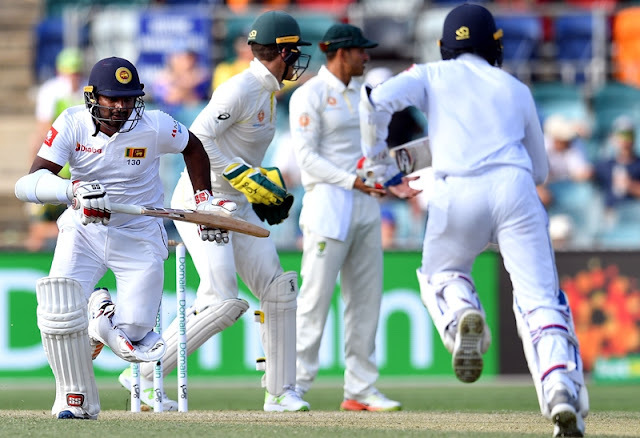 Ends by thanking the Sri Lankan team for coming out to Australia and playing in these difficult conditions and also thanks the crowd, the management and the sponsors for sticking by them as the last 12 months have been quite difficult. 09:54 IST: -Sri Lanka captain, Dinesh Chandimal, says they were outplayed as a team in all departments. Credits Australia for playing the way they did throughout the series. Reckons that having several injuries to key players didn't help but that's part of the game and they have to look at others now to step up. Continues saying that they are a young team which is still learning on how to play in such conditions. Hopes to do well in South Africa now. 09:50 IST:-Man of the Series, Pat Cummins, says he's pretty happy with how the summer went personally. Adds that after the India loss, he had a couple of weeks off so that helped. Feels that the wicket at the 'Gabba under the lights with the pink ball was amazing. Continues saying that the Burns-Head partnership really set it all up. Ends by saying that there's plenty of time left for the Ashes, so there are plenty of guys who can take heart from this and look forward to that. 09:48 IST:- Man of the Match, Mitchell Starc, says he tried to forget everything and bowl as fast as he could. Adds that the wicket slowed down a bit but he managed. States that they had an idea about what to expect here and the momentum from the win in Brisbane really helped. Reckons that this was the kind of game they were searching for all summer and is happy they ended the season on a high.